I have finally returned to make a work that I love! 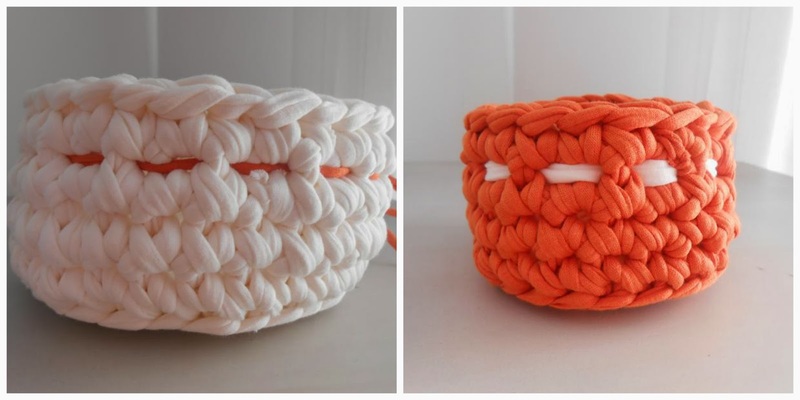 Baskets made ​​of t-shirt yarn! This is so funny! 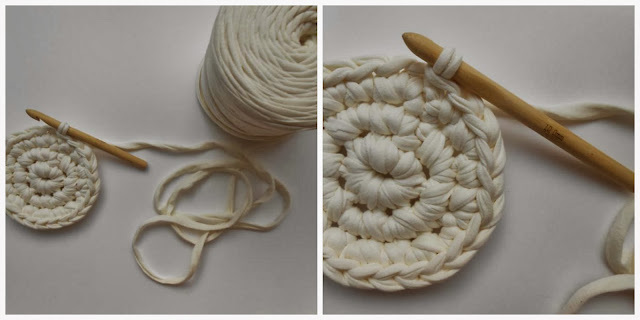 can always going back to patterns of t-shirt yarn when you desire! as many times as you need with just one click! 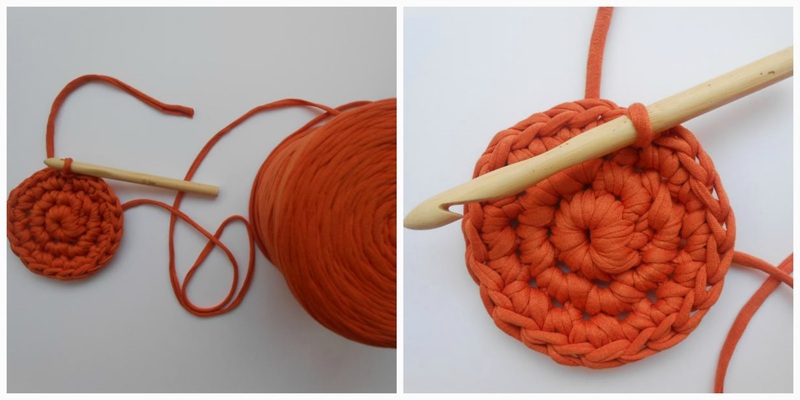 But this time I also added a little detail to each basket made ​​t-shrirt yarn. By take the opposite color for to make a small tape around the basket. What do you think of this? you like this? yes... ???? not... ???? I love these colors .... and baskets are always good for everything, right? to decorate the home and to store things .... for many things! to make baskets with t-shirt yarn, yes! Thousands! This is fantastic! is so beautiful imagine and redecorating the house! i like it very much! ( yes, Montse! for you ) because finally I do not have tendonitis! done with t-shrirt yarn and maybe a new pattern! Molt maques nena, m'agrada molt venir de visita per aquí! uns colors molt macos de trapillo! I really like the bow detail, Cristina! Good thing that you feel better!!! These are so pretty and hooked very neatly! molt bonics els colors triats !!!! Very cute. LOVE the opposite color ribbon trim. 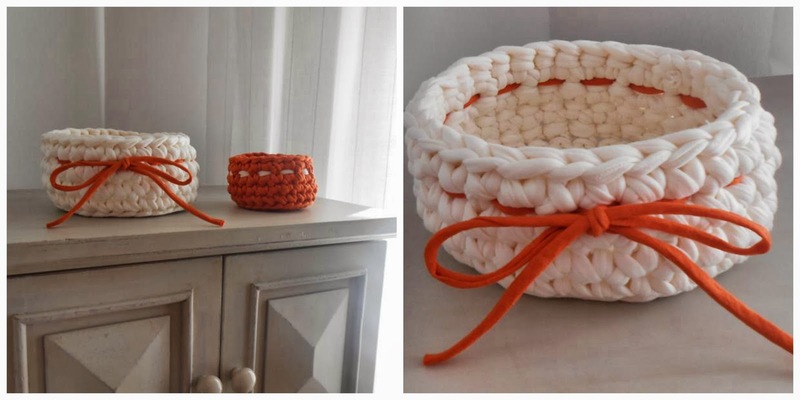 Baskets are so extremely useful for everything. I have made them out of triple strand of worsted weight yarn in different colors and they are so cute. I will try the t-shirt yarn one day after I have used all my stash-I have so much yarn, Cristina, I should send some to you !~! Molt xules les dues cistelles. Treballar amb trapillo costa, la tendinitis va ser deguda al trapillo? ostres, no havia pensat que ens podiem lesionar fent ganxet!!! Nooooooo!!! jajajaja!!! la tendinitis va ser degut a un cúmul de coses i després vaig patir una forta caiguda que ho va acabar de rematar!!! però, és clar, he estat uns mesos que no podia fer gens de força amb el braç dret.... i el trapillo requereix una mica mica d'esforç que no pas el ganxet tradicional. Però no pateixis, Núria, que ja estic millor! El que ens lesionarem amb tant de ganxet i cosir seran les cervicals... com totes les modistes! però, mira, els esportites pateixen dels genolls i cada cosa té lo seu, no? no podem pas estar-nos sense fer res! si més no, jo no puc! necessito fer cosetes! Moltes gràcies per passejar-te per aquí, Núria! Quines cistelles tan xules! Els colors i les fotos transmeten l'efecte d'un trapillo molt gustós!